A Beautiful Olive Wood Nativity Set. 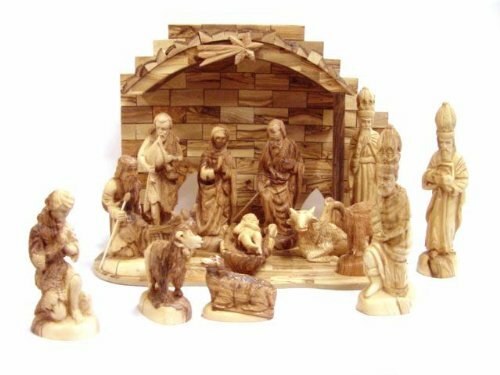 This Olive Wood Nativity Set has intricate and detailed carvings. Special attention is given to detailing facial and garment features . A very popular traditional design that will dazzle your guests. Set includes: Joseph, Mary, Baby Jesus (in his crib), Three King , Three Shepherds, a cow, a donkey and two sheep. It will add a magnificent décor to your home during the holidays. Set also includes a large stable collapsible stable. Hand-made from the Bethlehem Olive Wood. A very popular traditional design that will dazzle your guests.